Oh, hello! Long time no cook! Well, that’s not true, exactly. We’ve been cooking, but it’s a lot of the same old standards lately, and I have not really found anything new or worthwhile to share. Until now! It’s true: I needed another pizza crust recipe like a hole in the head, but the siren song of the NYT Food Section is just too hard to resist sometimes. Don’t do it, my jeans told me. Just walk away and do not look back. Be strong. Pizza is not your friend. But I stupidly bookmarked it, and long story short, I’ve made this now five times. I love, love, love it and now feel compelled to share it with you. This recipe has definitely earned its place in my archives, and I know if you try it, it will become a favorite. It’s as easy as it is delicious. Let me know what you think! Put the flour, yeast and salt in a food processor. With the machine running, pour the oil through the feed tube, then add the water in a slow, steady stream. Continue to process for 2 to 3 minutes (the dough should form a rough ball and ride around in the processor). The finished dough should be soft, slightly sticky and elastic. If too dry, add a bit more water; if too wet, a tablespoon or so more flour. Lay a 12-inch-long piece of plastic wrap on a clean work surface. Work the dough into a rectangle on the plastic, about 8 inches long and 6 inches wide. Press your fingers into the top of the dough all over, making indentations as though it were a focaccia. Fold the left third of the dough over (as you would a letter) and repeat the indentations. Fold the right third over and make the indentations again. Cover the folded dough with plastic wrap and let rise for 20 minutes. Cut the dough in half, form each piece into a neat ball, wrap tightly in plastic wrap and transfer to the freezer. The morning before you want to make pizza, transfer the dough to the refrigerator to thaw. Bring the dough to room temperature, 15 to 20 minutes. Put a pizza stone in the oven and preheat to 550 degrees. (If you don’t have a stone, oil a rimmed baking sheet and set aside.) Dust a peel or the greased baking sheet generously with cornmeal. Working with the dough in your hands (not flat on a work surface), gently begin to stretch the dough into a circular shape, pressing your fist into the center of the dough and pulling at the edges with your other hand. With both hands, stretch the dough, being careful not to tear it. Working in a circular motion, pull the thicker edges of the dough outward, letting gravity help you. Continue to stretch the dough until it’s relatively even in thickness (the edges will be thicker) and you have the size you want. Carefully lay it on the peel or baking sheet. Top the pizza as desired and either slide it off the peel and onto your heated stone, or place the baking sheet into the oven. 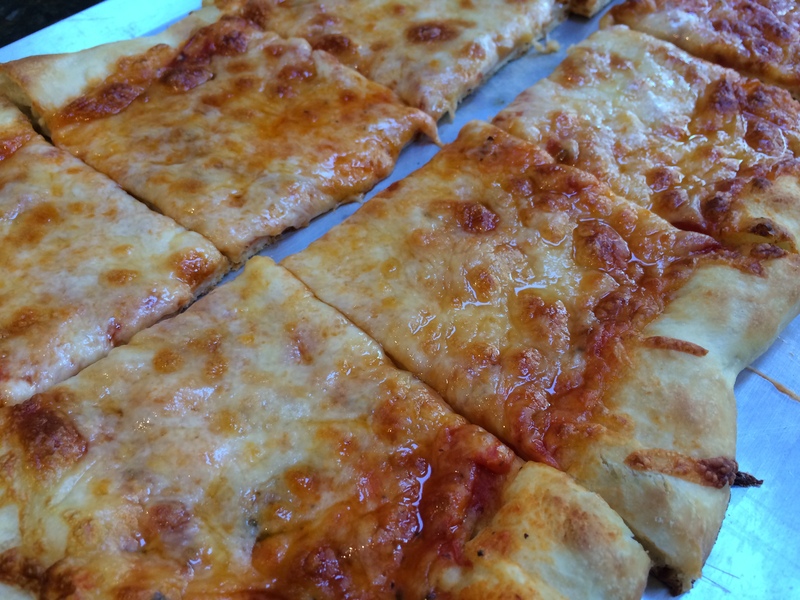 Cook the pizza for 6 to 10 minutes or until the crust is golden and the cheese is bubbling. 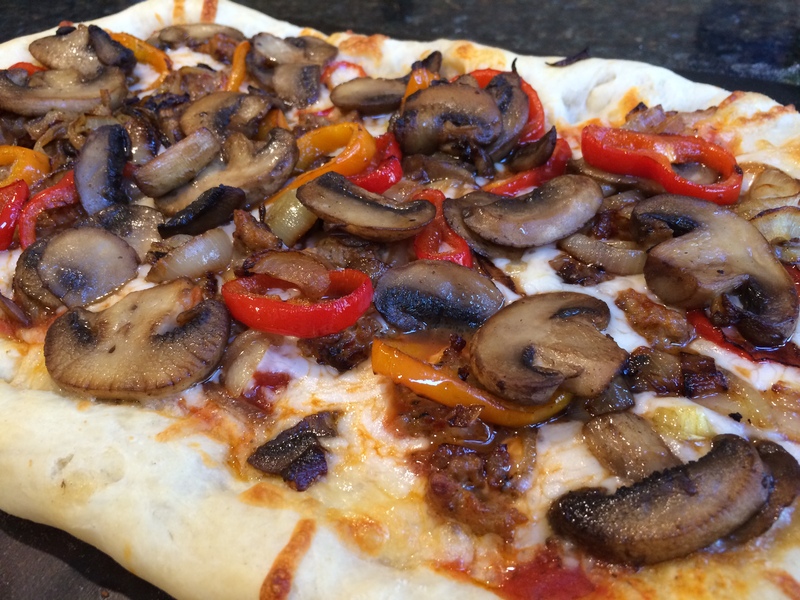 This entry was posted in Main Dish and tagged best pizza crust, easy pizza crust, quick pizza crust by Mom Mom's Apron. Bookmark the permalink. This looks like something I can do! It is! It is! I can’t wait for you to try it, Barb.